Order a FREE copy of the 2011 Lighting magazine (a $6.99 value), presented by ALA and Better Homes & Gardens Special Interest Publications. The 120-page publication features the latest lighting designs for every room in the house. You will also learn about the new advances in light bulbs and the best secrets on how to get the light right. Additionally, products from the leading lighting manufacturers are shown throughout the magazine in a proper room setting giving you ideas how lighting can dramatically transform a room. 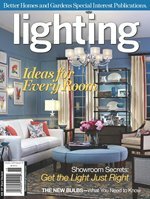 Lighting magazine is produced by Meredith Publishing, the same company that publishes more than 200 titles including Better Homes & Gardens, Country Home, Traditional Home and Ladies Home Journal. You can also view Lighting magazine online.